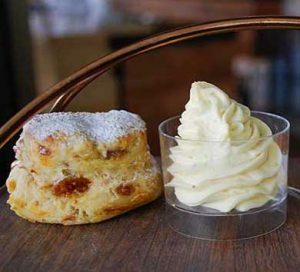 Fig Scone recipe from the Spanish High Tea at Heno & Rey Perth from Andrew McGie, Director of Food and Beverage at the InterContinental Perth. 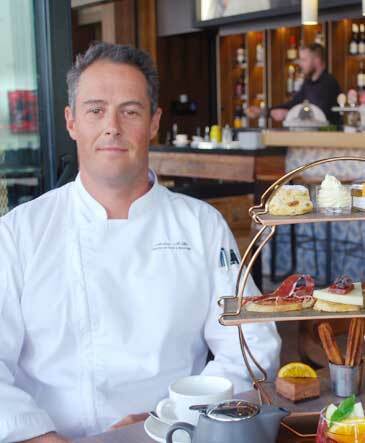 With over 20 years in the hospitality industry, Andrew can’t imagine doing anything else. Inspired by his childhood where cooking and socialising went hand in hand, his passion lies in bringing people together to enjoy a delicious meal. His cooking style heroes the highest quality ingredients where they are treated with the utmost respect and of course, tradition. At Heno & Rey, you’ll get a sense of Andrew’s vast international influence and experience, having worked in the United Kingdom, Abu Dhabi, Portugal and many more. Learn more about the Spanish High Tea at Heno & Rey. Sift self-raising flour and ginger powder into a large bowl. Using your fingertips, rub butter into flour until mixture resembles breadcrumbs. Add 1 cup of milk. Mix with a flat-bladed knife until mixture forms a soft dough, adding more milk if required, then add chopped figs. Knead gently until smooth (don't knead dough too much or scones will be tough). Lightly dust a flat baking tray with plain flour. Pat dough into a 2cm-thick round. Using a 5cm (diameter) round cutter, cut out 12 rounds. Press dough together and cut out remaining 4 rounds. 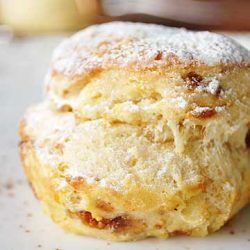 Place scones onto prepared baking tray, 1cm apart. Sprinkle tops with a little plain flour. Serve warm with orange marmalade and cream.